This discussion was created from comments split from: Why the numbers on the pylons at the Chesapeake Bay Swim are screwy, I have the reason. The Bay Swim doesn't separate out non-wetsuit swimmers in the awards so most people wear wetsuits. Not that I've ever won an award, but I'll be wearing a wetsuit this year too. Not going to bash GCBS for their policy of not differentiating between skins & wetsuits; it is what it is. But for those of you who do not swim in the bay regularly, please note the water temp was a very comfortable 73.3 last Sunday morning. This week has seen air temps in the high 80's/90's plus the fact it is a late start time this year. It will be toasty warm, dare I say dangerously hot for those wearing wetsuits. I know why most choose to wear neoprene for this race. I ask, is it really worth the health risk to shave a few mins off your time? I find the USAT Wetsuit rules about right. If it's below 78 I'll stick with the wetsuit, have done it before at this swim and others. I think it was 3? years ago there was hot water. If it's over it'll just be polka dots. I didn't spend any time during the swim looking at the bents and piers but I did manage to spot @Kevin_in_MD still discussing them following the swim. Saw some forum members and plenty of other friends. Water temp was announced at 76 degrees but felt considerably warmer. 174/619 finishers went without wetsuits. That is the most non-wetsuit finishers I can remember in my 7 swims there. Maybe things are slowly changing at this swim. @JBirrrd, we even saw the polka dots. Congrats on a another great swim @Franco , @Kevin_in_MD and everyone else who participated yesterday. Very glad to hear that so many people used common sense and left their wetsuits on shore. However, I am not giving the organizers of GCBS a pass. It is their policy that has created this situation. Even with the high temps of yesterday, many folks still felt pressured to wear a wetsuit to level the playing field. It is an easy fix. This event raises enough money to allow for a separate awards division. It is a well-organized machine and with the technology already in place it would not be difficult to identify those in wetsuits & those not. For the life of me I can't figure out why they won't do this. I was surprised how many people were in full sleeves! There were some spots were I felt I was swimming in a jacuzzi I can't imagine how hot it would have been with a wetsuit on. Congrats to everyone who finished the 4.4 mile bathtub race! I was totally befuddled by the people in wetsuits as well...I have no idea how they didn't collapse from heat exhaustion just standing on the beach waiting for the start. There were a few cold spots in the middle where I had serious thoughts of stopping and treading water for a while. But, as nice as those were, they made the rest of the race feel even hotter. I am stunned that there wasn't even a mention in the pre-race meeting that it might be a good idea to leave the wetsuit on shore this year. I didn't realize they didn't have separate awards for wetsuit and skins/ It gives me pause to think about my desire to do this race. In the long run I doubt it would stop me from swimming it but it would tick me off before and afterwards. Nothing to be ticked off about, really. You know what you are up against going in, so no stress and besides, afterwards you can wallow in your moral superiority. Just be careful - I was in a different race where they allowed wetsuits and afterwards a spectator asked me what I thought about competing against the wetsuit people when I didn't have one. My response was something like "Those people are the athletic equivalent of people who never brush their teeth" or something similar. One of the wetsuit people overheard me, got right in my face and started screaming at me. I just stood there until he finished his diatribe and then said, "Do you feel better now? Good, now go away." He stormed off. To me it is not about being morally superior (I know, I know, you were joking...kind of). There is absolutely no judgement here about the decision to wear a wetsuit in this race, or any. It is the fact that the choice is made more difficult b/c of the lack of differentiated categories. I no longer swim GCBS for this and other reasons, but many of my friends do. It is a huge event in MD & the surrounding area. I've only entered it once and yes, I wore a wetsuit. It was my 2nd ow race and I knew no other way, as it just seemed to be what everyone did. GCBS is a great intro to open water swimming, raises lots of money for charity, is exciting and seems in every other aspect a well-run event. BUT it is an accident waiting to happen. When competing in races where suits and skins are not differentiated, I've used a combination of gear that is "category 2 swimwear" but is not a wetsuit. I occasionally wear a Sailfish shorty swim skin and a pair of TYR neoprene arm skins against wetsuit swimmers. I'm not sure the swim skin helps a whole lot more than my slick Agon kneeskin racing suit does, because I already have good body position. I believe the arm skins are of some advantage because they increase the surface area of my forearms, although I'm thinking of cutting them off at the elbows because I don't like them squeezing my biceps. I think I'm roughly the same speed with or without my sleeveless wetsuit, so I don't worry too much about my results against wetsuits. I just keep in mind that the average wetsuit swimmer is probably getting 2 minutes per mile advantage, (some are getting lots more) so if they didn't beat me by at least that much, they probably wouldn't beat me without one. I've swam so many races that I've had the chance to race lots of people repeatedly and I've noticed that several people who I thought were unbeatable (by me) were, in fact, very beatable without their wetsuits. I was at a race on Friday night in a lake that was mid-70s. The majority of swimmers wore full suits. I don't know how they stood it because I was hot coming out of the water in just a swimsuit. I had my best time on that course and came in less than a minute behind the first woman wetsuit (you know what I'm thinking here). Fortunately, this race has separate categories and I went home with an apple pie. Totally agree @JBirrrd. I was floored how many times I heard my triathletes (when I coached them with DC Tri Club) say things like, "Well, the wetsuit will help me with my body position," or "I haven't gotten much swimming in, but I'm using a wetsuit, so I'll be okay." It reminds me of the video of the Alcatraz swim where a man died. Just seeing those wetsuited folks struggling...it truly is an accident waiting to happen. BUT it is an accident waiting to happen. Is the risk of heat injury higher than the risk of other issues during the swim at the temps that we had Sunday? When I consider the entirety of people at the race, I'd say "other" is much higher. To that end having people in wetsuits helps, at the very least it makes them easier to spot if they stop moving or struggle since they will be higher in the water. Considering only those of us posting here, I might say the opposite. If I were the safety officer, taken all together thinking of the 600 people in the water, I'd make the same call - I'd prefer to have more people wearing flotation than not. By simply changing the format of the results, and definition of "overall winners" to recognize separate categories, they would allow people who want to wear wetsuits to wear them, and allow people who don't want or don't need wetsuits to not wear them, without fear of being penalized in the results. They wouldn't have to change anything about the actual running of the race -- only the format of the results. So simple. I don't see how it improves safety to incentivize participants to wear swim apparel they're not comfortable with, just to have a fair shot at competing. Sad to say, that accident has already happened. The swimmer who died in 2014, though, was an experienced swimmer, active in USMS, and on his 20th bay swim. Can't find any references to whether he wore a wetsuit, but the stories all say he had a heart attack--not sure if a wetsuit would have made a difference for him. That aside, I mostly don't use a wetsuit, and if that means I miss out on awards for that reason, so be it (not that I'd have a chance with a wetsuit either at my "speed"). I like the freedom of not wearing a wetsuit, as I don't like wearing constricting things while swimming--and on a hot day, I would think a wetsuit would be very uncomfortable and not even give a person any advantage b/c they'd be working so hard and overheating. But that's just my guess as a non-wetsuit swimmer. Personally, I don't judge anyone's choice of what to wear in a race. I go with what feels right for me, and if someone wants to wear a wetsuit (well, sometimes with friends, I'll tease them gently) I'm cool w/ that. I've been holding off on posting, but feel that I need to get this off my chest. I swam the GCBS last year. I finished 6th in my age group, about 7 minutes behind the top three finishers. However, I was the first non-wetsuit finisher. From what I've read bout the time advantage of wearing a wetsuit, I very well may have finished in the top three. Going into the swim I really didn't care about where I placed and was only focused on completing the swim (my longest to date) and finishing under my goal time. After having time to think about it afterward, I do get a bit upset regarding my 6th place finish. But, I also realize that my swim and finishing time was all me without any artificial help. It's a moral victory, but still a victory. My feeling on this is that if they are going to give awards for top finishers, they should break out the skin and wetsuit swimmers and provide awards in both categories. I looked at the results and they do break out skin results and rank them. The organizers need to spend a few bucks and reward the skin swimmers for their efforts. There are enough of them to make it worthwhile. The 2015 installment of GCBS was my first one. I found the water at the beach warm, but not having ever done this race and not being from the area, I was afraid the water would be cold once we got away from the beach. I was one of those swimmers who did wear a wetsuit, and I wish I hadn't. I did succumb to the heat when I got to the Eastern Shore. You live and learn, I suppose. In the end it was my choice and my responsibility, but I wish the RD had cautioned swimmers that the water might've been too warm for wetsuits. I saw many a swimmer being treated for heat injuries. As for skins v. wetsuits, there should be two categories each with their own awards. I don't consider mixing categories fair to the skins. My one and only GCBS was in 1995. 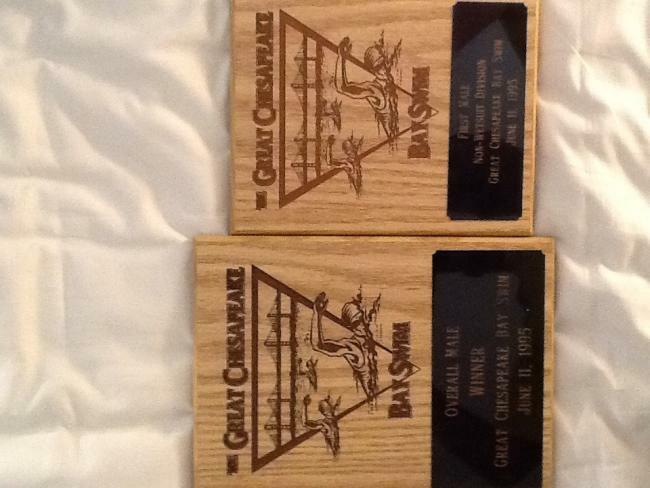 There were seperate awards for only the overall non-wetsuit male and female swimmers along with the all-encompassing "Overall" awards. I had a decent day even though my swim bag was lost. My thoughts are that if you're good enough to contend for a top position, you have no business wearing a wetsuit. While I haven't a chance at a top award -- whether or not I were to wear a wetsuit -- I agree that there should be wetsuit and non-wetsuit award divisions in races. But personally, I wonder if I'd feel so overheated wearing one that it wouldn't be much benefit. As bluemermaid mentioned, people were suffering from the effects of the heat by wearing them. The one time I wore one even in 50something degree water, it felt weird, constricting. But that's just my experience. This was my first OWS ever. In1989. Looks like you did it in 86! Grew up in Maryland and actually only about a half mile from the Chesapeake Bay. My dad (an avid swimmer) attempted the GCBS but there was some issue with boats crossing so he never got to finish. Since I still have ties to the area, it's a tempting race for me to attempt. From my youth, I remember jellyfish being pretty fierce in the Bay at some point in the year but I assume this is probably done before peak jelly season. I've done the full GCBS crossing once, and the mile event there twice in all butterfly, and twice guiding a blind friend. It's a nicely run event and very supportive of the swimmers. I've never had a nettle problem during the swim (early in the season). I doubt I'll ever be an award winner even in my age group as I fall into the middle somewhere usually. Chesapeake Bay swim lotteryAnybody have any idea how many people enter the 4.4 Ches bay lottery, and what percentage get in? Chesapeake Bay Swim lotteryFirst draw on the lottery is tomorrow. Anybody else waiting to hear if they got in?